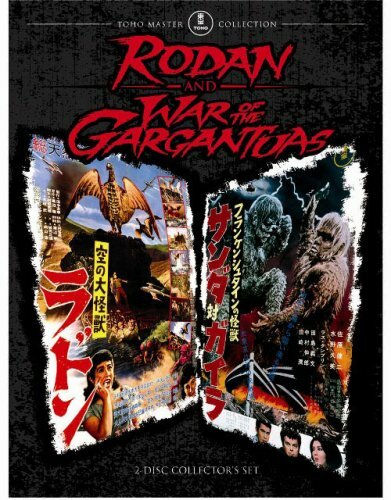 RODAN: Rodan, originally released in Japan in 1956 involves a giant monster being awoken from an ancient hibernation by human beings. In Rodan, miners digging far into the earth stumble across a clutch of giant, prehistoric insects which viciously attack several of the miners and prompt a government investigation into the matter. The giant bugs turn out to be little more than food for two gigantic flying beasts called Rodans, who hatch from giant eggs and proceed to terrorize the entire world. WAR OF THE GARGANTUAS: War of the Gargantuas, released in Japan in 1966 as "Frankenstein's Monsters: Sanda versus Gaira" and a semi-sequel to Frankenstein Conquers The World. It introduces two giant, hairy humanoids called Gargantuas, which spawned from the discarded cells of Frankenstein's Monster from the previous film and are described as brothers. The Green Gargantua is violent and savage, preying upon human beings; as he lives in sea water, he is given the name Gaira for "stranger." The Brown Gargantua had been raised in captivity, and is docile and gentle; because he resides in the Japan Alps, he is called Sanda for "mountain". The film follows the investigation and military engagements of these creatures until their climatic confrontation in Tokyo.